Hello! Welcome to Taylored Expressions May 2015 Release! All products that we have been peeking this week are now available in the TE store, HERE! Before you head off to shop, I have a final project to show you. 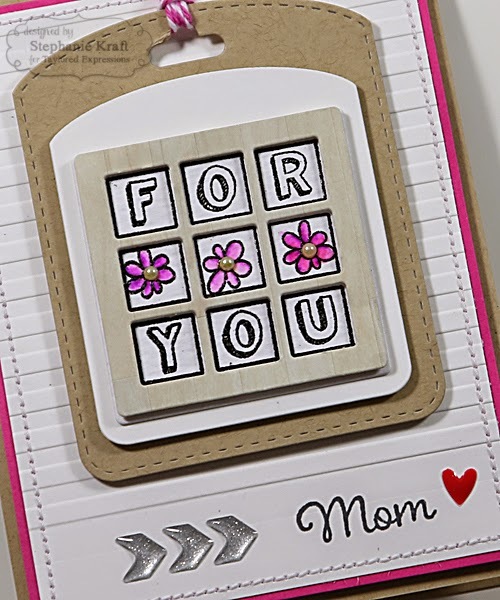 I made this card for my mom for Mother's Day using the new Gridlocked stamp set and Gridlocked die. I started by stamping the image with Versamark Watermark ink onto watercolor paper, sprinkled some black embossing powder over it, then I heat set it. The trio of flowers was colored with Spectrum Aqua markers and a water brush. The entire image was mounted onto a few layers from Build a Tag 4, creating a tag, which I added to the card front with foam tape. The "Mom" sentiment is from Greetings for Her. I managed to get this card sent off to my Mom this past weekend along with my first completed quilt! I used Moda Fleurologie fabric and modified this pattern slightly. I could not have completed this without the help of my SIL, Mary! She helped me start this at the beginning of last summer and guided me through each step. It is a labor of love, and I hope my Mom enjoys it (and uses it!). My little model Bella pretty much stomped all over it whenever I had it laid out on the floor. I think she was a little disappointed when it went into the box! Accessories: Taylored Dies: Build a Tag 4, Gridlocked, Corrugated Embossing Folder (TE); Aqua Markers (Spectrum), Arrow Sprinkles - Silver, Heart Sprinkles - Ladybug, Twine (Doodlebug); Black embossing powder, Pearls, Foam tape, Thread, Sewing machine. Love how you divided the sentiment on this super cute card, Stephanie...your mom is going to flip when she sees her card and the quilt!!! Oh Stephanie, your tag card is lovely. I love the stitched details and bit of bling. You quilt is equally lovely and I am sure will be a treasured gift. Thank you for the inspiration and sharing. Such a pretty card and quilt Stephanie! Love the pretty Moda fabric! 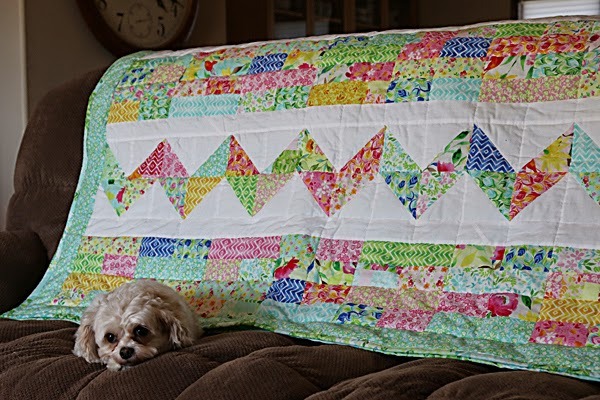 Your quilt model is ADORABLE! Hope you have a Happy Mother's Day!